The HHO threads are also very interesting. Thanks for the additional background. Replication is often next to impossible. A few small successes from time to time keep me interested and always learning. I hope this helps for calculations anyone else wants to try or just for documentation reference ... good luck ! 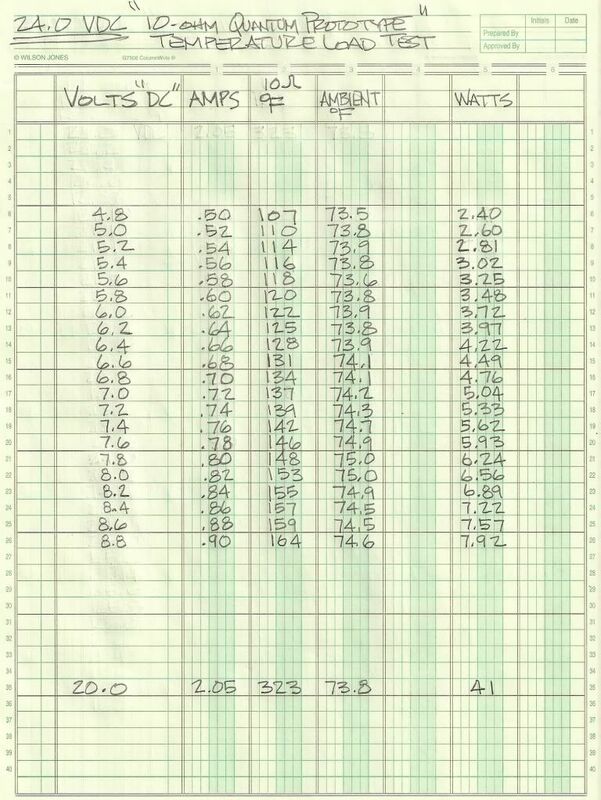 I totally forgot that you placed my custom made 10 Ohm "load inductor" temperature profile data sheet in one of your postings and your right about the documentation including the dated photograph with the data sheet seen in it. I am also very surprised no person in the entire alternative energy community has reviewed any of the "extensive" collected data and videos that was compiled on my testing and evaluation and has made any kind of remarks on the results of twenty two (22) tests .... if wrong or right ?? gate driver. Does the same job. In one case (1) I use a pulse width modulator PWM controlled by a HEX switch setting the mark period. Tests on the related circuit is usually limited to 50% M/S maximum. PWM is @1.6KHz. In the other case (2) a square wave is frequency set to that desired by programming the PIC. Currently using 10KHz. Both have been designed after making several Adam/Bedini type motors. The main observation was initially concerning the maximising of the BEMF amplitude collected in a capacitor (many values). From the driving coils initially the after realising no moving parts were needed - the switched coil BEMF was harvested. I soon realised the value of the BEMF was being limited (as seen by a flat top on the pulses seen at MOSFET switch off - when viewed on an Oscilloscope. In short the value reached was mainly limited by the internal MOSFET diode. The highest value I have purchased at an affordable price is 1500V. Using this I charge a suitable capacitor to 2000V. Back to the similarity to the Rosemary Circuit - I have experienced the inductor used to generate the BEMF getting very hot where it should not. increasing the inductance but the power of the unit is reduced. This was observed by monitoring the amplitude of the current pulses seen when recharging a car battery. A small value (1ohm) was put in series and scoped the voltage I=E/R. I was seeing greater than 10A pulses at either 1.6 or 10KHz rate depending on the drive used. Currently not tried to maximise the heat as yet - hence the interest in your tests. This might not be the thread to outline my observations but I am finding a common link in many of the reported experiments that are aiming at different ends!! If this is in the wrong place please let me know as more observations and feedback are of great interest. As a ex large company Electronics Engineer I miss the discussions of old. Yes - it is a bit perplexing that no persons have downloaded the custom database program I wrote to assist in evaluating your data since it consists of 100,000 rows of data which exceeds Excel limits for versions prior to 2007. I can only conclude that either they are willing to accept my limited analysis of the data or they simply are not interested in it. There is no excuse for not downloading the data and reviewing it themselves since it has been widely advertised throughout the community as to its existence and precisely how to download it. I never received even a single PM here or elsewhere regarding the program, the tests or the data which speaks volumes regarding the lack of interest. I still think we need continuous uninterrupted data on a single circuit design (where the oscillator and power stage draw power from the same source) with a run long enough to exhaust the supply source by at least 1.25% and academically acceptable calorimeter and hydrometer readings included in the data. IMHO, it is the only way this circuit will ever be taken seriously. Failure to at least meet that minimum puts the system well below commercially available heat pumps making it unworthy of further development by commercial standards as there needs to me some redeeming value or competitive edge. Your custom resistor, however, stands on its own merits completely independent from any particular method of driving it. In this thread, I did a comparison of that resistor to my standard 1500W Oil based heater and your resistor wins that analysis as being more efficient even with DC. So while the driving circuit seems to be fraught with issues, I think your resistor has some viable future application worth developing. There are plenty of ways to drive it without infringing on anyone's intellectual property. You may want to look into the work of Charles P. Steinmetz and his Induction Furnace Patent. Understanding of Steinmetz Law along with understanding inductor core eddy currents can help in pinning down the cause of anomalous heat. It would be interesting to find out if your inductors heat up in a vacuum or oil with the same thermal curves as they do in free air. Especially if the wire has any Nickle exposed to the surface. If you are using a Mosfet and your inductor is acting like a resistor, then this would probably be the place to share your information and ask questions . This Mosfet Heating Circuits thread is a subset of the Inductive Resistor section. The clamping from the internal avalanche diode wastes the energy into the Mosfet and is generally undesirable. There is also an effect present in AC systems that does not exist in the DC profiles, called the Proximity Effect and this too can lead to anomalous heating that is not otherwise explained. Apart from these things, it surprises some to find out how much power is being dumped back through the inductor during the BEMF pulse ringdown. Simply analyzing that power across the internal resistance of the wire can explain much of the heating. An lastly, Harmonics are notorious for adding to the power losses and causing heating in inductive systems - being a Ham I'm sure you're familiar with that in the antenna systems and SWR scenarios. Hi Harvey Thanks for the comments. I am not sure my inductor is behaving as just a resistor. Firstly it is constructed on a ferrite bead about 18mm outside dia and uses 100 strand Litz wire - measures 0.193mH and 0.5ohms. My test meter checks at 20kHz so not too far from my current 10kHz op Freq. With just this as the MOSFET's drain to supply load I see BEMF pulses of 1500V on my scope (good job the probes from China are cheap!). In order to collect this BEMF I am using a separate coil and capacitor series tuned by adjustment to 10kHz. (about 5mH),t with a moveable Ferrite core. This is connected from Source to Drain via 0.07uF 2kV wkg cap. & from the mid point there are two 1kV diodes in series to a 1uF 3kV oil/paper cap. The DC measured is 2kV across this capacitor. This charges in very quick time 1-3 seconds hard to determine. I have at one time earlier had either 25uF @ 4kV or a string of 2000uF 450v El Caps to similar voltage. But a bit lower with the Electrolytics due to their leakage. As I am using my AVO meter on the 2.5kV range, and the needle does not move too rapidly any time. I am also seeing (at the Centre of the Tuned Circuit) approx 200v sine wave which I can maximise. The input current from the (12v nom) PSU minimises and the voltage measures 15v (about 16v no load). Input current checked at between 150 & 250mA varying with tuning. I will report further after some comments please. Again many thanks for your references very interesting. Last edited by waltersm; 04-18-2011 at 07:31 PM. The last link is pretty good as it provides a much better match to the empirical measurements than the Steinmetz formula alone - at least for that product line at Micrometals. I think you may still be losing energy into the primary inductor on the BEMF reversal. You may want to experiment with placing two of your diodes between your primary inductor and the Mosfet drain so that the BEMF energy cannot fall back into the primary. The way you have described your circuit, that energy is split between the two paths in the two inductors and the diodes would block the reversal into the primary forcing the energy to dump into the secondary inductor. The problem I see though is that the tank junction will elevate to just a bit above the 3 kV output capacitor and will act to waste that tank storage on the next Mosfet trigger. This is where using a smaller capacitance in the tank works in your favor. You will still want a low resistance secondary inductor to dump the BEMF into the 3 kV output cap. It sounds like you have a relatively good design there to recover the energy (I haven't checked your values and resonance). But you do have to keep the BEMF below the avalanche threshold of the Mosfet - that's the only real caveat that I can see in your setup apart from what I have mentioned above. Yesterday I did two resistors in parallel and as Harvey told me the amperage remained the same. Interesting I will add more and see how much heat will I can get from more resistors. If so, I wasn't indicating that parallel resistance does not increase current although I can see how my post may have been taken that way. Instead, I was stressing that we can add more resistors in parallel provided the resistance in higher in each so that the resulting current stays below the MOSFET amperage rating. Clearly, the current will be more than any one of them by themselves because the formula for current is Volts / Ohms = Amps and the lower the Ohms the higher the amps. So, if we keep our amps to 6A, the voltage would have to be no more than 13.56V with that setup. But what if we want to switch 900V instead? Now we could put 66 sets of those 3 parallel resistors in SERIES (900V / 13.56V = ~66) and the result would be about 6A for the entire SERIES / Parallel Matrix of 198 Resistors. Yes I was referring to that post. I am trying more resistors in parallel to see if heating increases. a lot of inductance that have iron cores for example. 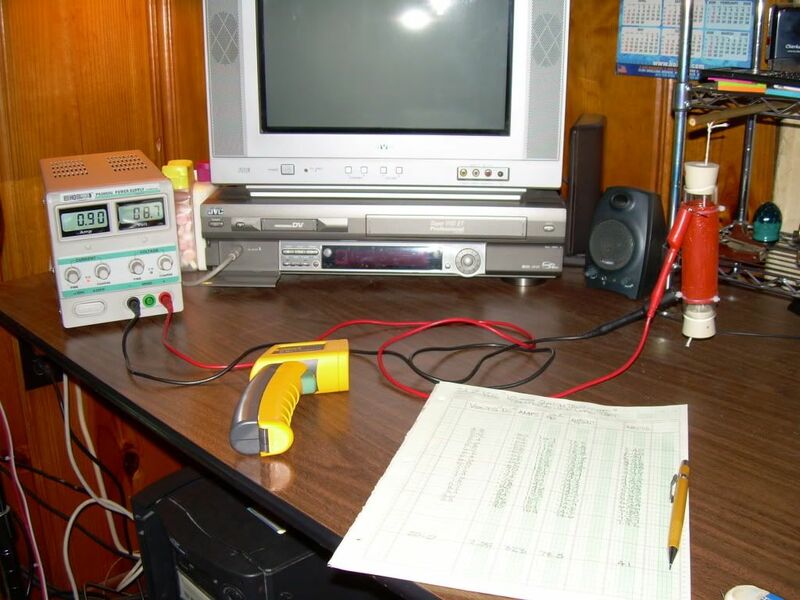 If you want to provide the values associated with your available resistors and the power supply information (voltage and current) I can help you arrange them for optimal heat. Also, as Aaron mentions - if you have a means to determine the inductance that would help as well as the inductance plays an important part in the resulting impedance at specific frequencies. Lastly, rather than assume you are using the IRFPG50 - it would be good to know for certain what the specifications are for the MOSFET you are using, so providing that will be important as well. Heat was quite good on both resistors. Why are you using a 6V to power up the 555? IC like 555 only needs a 5V supply. Try using a regulator to obtain an exactly 5V to power up your 555. This might be the cause of your problem. You are not using the proper Vcc for your IC. Last edited by francis44; 01-28-2015 at 08:59 PM. I'm having problems understanding your post because the circuit in this thread under discussion uses a separate 12 volt supply for the 555 timer circuit. You might take the time to review the thread and resolve your problem. I'm glad to see a recent (supportive) thread and post on this topic. For several months I have been trying to come up with methods for analyzing the performance of my Variant-Version of the MOSFET Heater experiment that do not require use of an expensive analyzer, scope or specialized equipment , though some sort of scope is helpful (cheap PC scope maybe just for general tuning). I conclude partly that the circuit I'm using is what has been referred to as the 'corrected circuit' by others elsewhere. This is pertaining to the general circuit wherein a diode passes from FET Drain to B(+). I do not use the 555 Timer, I use my own digital PWM and a MOSFET Gate Driver chip instead. Anyway, I have not come close to a COP>17, or 10, or 5, but I am seeing consistent results in the COP>1.2 to (almost) COP of 2.0. In my tests, I run the circuit at a frequency exceeding 100KHz and around 25% Duty cycle. I run the circuit long enough to produce a stable Differential Temperature and then start recording that temperature. I use fairly small batteries (series 2 x 12V AGM x 7Ah = 24V) for which I have generated a Battery Calibration Discharge Curve using a 200-Ohm x 10W 1% resistor as the load. I record and manually plot the voltage drop of the battery bank (Circuit Discharge Curve), differential temperatures, 12V battery operating the PWM/Driver, etc. I do this for 6-1/2 hours on the hour + that last 1/2 hour. At the end of the 6-1/2 hours, I disconnect the circuit from the Inductive Resistor and calibrate the Inductive Resistor using a Precision DC Power Supply. I adjust the Power Supply levels to produce the same Temperature differential as maintained during the 6-1/2 hours of circuit running and record the Voltage and Current of the DC Power Supply (this can take hours to stabalize). I multiply the Supply's VA and that is the power the circuit was PRODUCING during the 'circuit run'. [AHEAD OF ALL OF THIS: it required that I perform many 'dry-runs' aimed at adjusting the PWM Frequency and Duty cycle to produce a Circuit Discharge Curve substantially parallel to the Battery Discharge Curve when plotted on the same graph]. You now have a clear picture of the Power Consumption of the Circuit (any voltage corresponding to a voltage on the Battery Calibration Curve V^2/200 Ohms ... because the slopes of the two curves are the same) vs. the Power Produced in heating the Inductive Resistor (because of the power value obtained from the Inductive Resistor's calibration using the DC Power Supply that immediately followed the Circuit test ). Using the same rationale (but reversed), plot the discharge of the 12V battery running the PWM/Driver, and create a Calibration Curve for that battery that produces the same slope as during the circuit test ... this means you need a variable resistor to do that. You also need to use a CSR to measure the quiescent current (thus power) of the PWM/Driver. You need to consider this quiescent power at some level. Via that CSR, I believe you can also measure the sourcing and sinking currents used by the PWM/ Driver ... that being the difference between (just) the PWM running and (both) PWM and FET firing. I'm not absolutely positive, but I think you must 'add' that difference in power to the power consumption value attained earlier. I 'add' this value ... just because. Sorry that I was so 'long-winded' trying to explain this procedure, but it may better suit some of you experimenters and your gear, or it may be of no interest to you at all. If what your doing is a "VARIANT" to the circuit described in this thread by not using a 555 timer and using a PWM would you please open your own Thread in the main "INDUCTIVE RESISTOR" thread .... not here. If your unable to open your own thread I can do it or have it done for you. I thought news that someone had made some significant progress would be welcome. I'm uninvited everywhere I go. Wonderful! Please make your own thread so that there is "NO" association to any work that has already been done in this thread. even this old fard recognized 555 specs. good info to know. dont know where others got there there's. I see this thread of yours is accomplishing allot. Look at all of the participation and progress. Congratulations! Yep .... It's always a bad thing to delete your postings gmeast and then cause degradation to others work because your work is/was a complete failure. I hate repeating myself to you over and over here and at other forums ..... I'm presently done with the "Rosemary Ainslie COP>17 modified circuit" because the original concept from the original inventor ( Rosemary Ainslie ) doesn't work as advertized or indicated and never did, thus the modified version I attempted over eight (8) months and twenty two (22) "POSTED" tests and it's "PUBLISHED" results. I invite you "AGAIN" to post your work of your experimental device in your own thread, being it's noting like the circuit described in this thread and please quit deleting your postings in a child like manner for a effort to make others look bad. That time of the month huh? What a wonderfully bitter individual you are. Failure??? Look in the mirror. So Greg .... does this mean your not going to share your WORK (link) anywhere ever ?? I see you pulled your electronic contraption attempts down also at R Ainslie's blog/forum whys that ?? I could possibly copy/paste whats been copy/pasted over at Overunity by their members here, in your very own personal thread ..... when I have some time to waste. Looking at the circuit I don't think it is any COP > 1. The circuit basically has to part, the heating part and the driving part. The driving part is the 555 timer circuits which turn on and off the IRF. The heating part is the 24 volt that connects in series with the heating resistor. The 555 timer circuit and the IRF just act as an automatic switch. The heating circuit is just an RC circuit (if you look at the battery as an capacitor) or RLC circuit if the 10 "Resistor" is really an inductor. So, by pulsing the current does not make the heater generate the same heat with less current, it is not like you are pulsing the motor. If you somehow get the heating circuit to go into resonant by the time the timer cut off then you might gain some heat there, how many COP I am not so sure (but it is not 17). Last edited by Johnytest; 02-25-2013 at 11:58 PM. Please delete the insults and especially the name calling - just stick to topic. You're both long time respected members of this forum. Hi admin, sorry, but I did NOT hurl the initial insults. And I certainly do NOT feel very respected here. I invite you, however, to visit Heretical Builders and see the culmination of several months of intense and diligent research. I'm sure you will find it interesting and maybe a little inspiring.